It has been quite a while since I reviewed any D&D material. As my campaign met more and more infrequently over the past months, I found myself purchasing fewer new products. So, I decided to look through some of my earlier items for review, and the first that came to mind was the first 4th Edition installment of the Draconomicon, focusing on Chromatic Dragons. As we look to D&D Next, it may seem strange to look back at what was a relatively early book in 4E’s development. According to the product page for the book, it came out in November 2008, less than half a year after the core 4th edition books hit store shelves. From the perspective of a person who came into 4E through Essentials, the book looks quite different than what I am used to. For the most part, though, the book is still very useful, particularly the non-statistic content. The first section of Draconomicon: Chromatic Dragons is titled “Dragon Lore”, a broad category that covers many separate topics. The first half of this section reads a bit like a biology textbook, detailing the physiology and life cycle of dragons. I felt the book gave a bit too much detail, stuff that was not immediately useful in a campaign, but the following pages on draconic motivations, society, and the relationships of dragons to the gods are more easily integrated. The second section of “Dragon Lore” looks at each specific variety of dragon in depth. 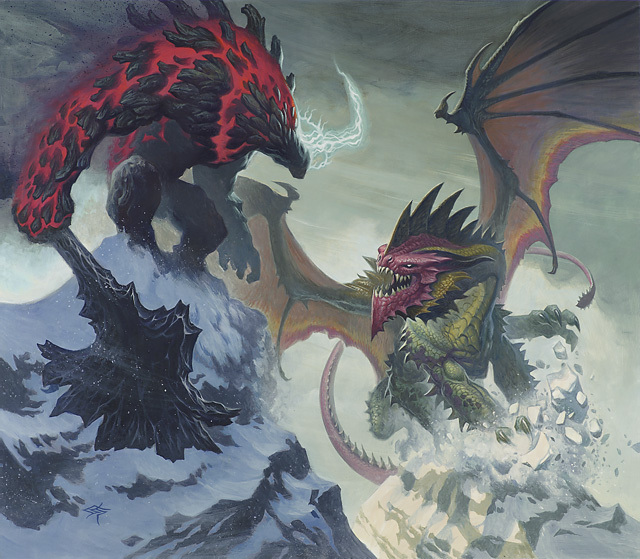 The differences between the various dragon colors have been emphasized in the past few editions of D&D, from an art perspective, at least. These pages give lots of information about what, apart from looks, makes each color unique from the rest. I appreciated this very much, as will most DMs who use a variety of evil dragons in their campaigns, and who want them to feel distinct from one another. The “DM’s Guide to Dragons” is the second major portion of the supplement. Unsurprisingly, these pages are among the most useful in the entire book. Sample encounters are provided, in both combat and skill challenge form. A few new traps are listed, most appropriate for dragon lairs but easily dropped into any adventure. I am especially fond of the pages devoted to adventure hooks, quests, and even two full-length campaigns all heavily involving dragons. Regardless of which version of D&D (or, I suppose, any other RPG) you are using, there is plenty of inspiration to be had here. Another excellent resource in this “DM’s Guide to Dragons” is the detailed rules for creating a dragon’s treasure hoard. Though intended for the large treasure parcels associated with dragons, these charts and guidelines are useful for any large hoard. Sample parcels for each level are included, but the best part are the different options and suggestions for interesting valuable items. Using art objects or fine materials instead of piles of gold coins in your treasures makes your fantasy world seem that much more real. A handful of draconic artifacts, including the Orb of Dragonkind, a favorite of Dragonlance fans everywhere, are also detailed here. The guide wraps up with new rituals and a nifty section on the magical properties of dragon parts. Next, the Draconomicon spends a hefty number of pages on “Dragon Lairs”. This section is a mixed bag. Though the background information and maps are quite useful, it’s painfully obvious that the encounter design is very early in 4E’s development. Still, there’s plenty of good stuff here, but be prepared to do some serious tweaking before taking it to the table. Nine different adventures, each eight pages long, are presented. The remainder of the book, just under half of the total page count, is devoted to “New Monsters”. I got the impression that everything draconic that didn’t fit into the first 4E Monster Manual was crammed into this section. Sadly, the statistics for these monsters are in the early monster block format, very hard to use in play. Also, this was written before the MM3 changes, so extensive alterations might be needed, particularly for paragon and epic tier foes. Details about brown, gray, and purple dragons begin this section. These creatures are hardly new to the game, previously being known as sand, fang, and deep dragons, respectively. Stats for various ages of these beasts are provided, as well as tactics, lore, and sample encounters for each. 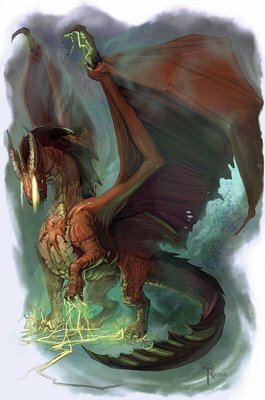 Following the “new” chromatics are entries for wyrmlings of the various colors, in case you want your PCs to beat up on a baby dragon sometime. Planar Dragons come next. Dragons, as such an integral part of the game, can be found on almost any plane your group might visit. The dragons listed run the gamut from incredibly evocative to quite mundane in theme. 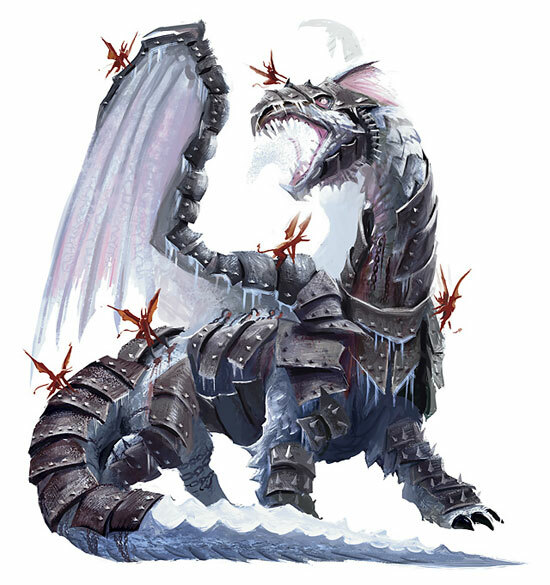 An example of the former would be the Frostforged Wyrm, a white dragon captured by demons and forced to wear painful armor plates, constantly being nailed on by small imps. An evocative image to be sure! Blight dragons, shadow dragons, and the various Feywild dragons are also worthwhile additions to your adventures. The dragons of the elemental planes, too, are quite interesting, and thematically appropriate given dragons’ strong ties to elemental magic. The dragons from the astral plane, though, seem quite vanilla compared to the others. They deviate very little in theme or mechanics from their standard brethren. Several varieties of undead dragons are also presented. The fan favorite dracolich appears in no less than four separate varieties. A few other standard monster types are grafted onto dragons as well, including wraiths, zombies, and vampires. Following these horrors are a few dragon related monsters, and these are hit and miss. More kobolds are always nice, and the Kobold Victory Table is as awesome as it sounds. Abishai are here, and rightly so. But some of these monsters are really stretching it; draconic parasites and drakes are dull, at best. On the other hand, living breath monsters, embodiments of draconic elemental power, certainly make up for the less compelling creatures in this section. Perhaps the best part of the Draconomicon, from a lore perspective, is the “Dragon Hall of Fame”. Eight different dragons, well detailed and suitably villainous, are available to be used in your campaigns. Each one of these would be a fantastic catalyst for an adventure, or perhaps even as the theme for an entire campaign. My favorites include Ashardalon, Cyan Bloodbane, and of course Tiamat herself. While the mechanics on these villains are probably woefully outdated, the motivations, backstory, and tactics presented for each are very inspiring, no matter what edition of D&D you are playing. A few templates and alternative powers are the last pages in the book. So what’s the final verdict? There is so much fluff here, it’s hard to not find something you like. If you play D&D, chances are you like dragons, and the Draconomicon is a vast resource for story and potential villains and encounters. It’s unfortunate that the book came out so early in 4E’s lifespan, as most of the crunch included here really needs updating before it can be used directly in your game. To me, I found the fluff elements alone worthwhile. Being an older book, it is likely available used at your FLGS or online; I paid around $12 for my copy a year ago. If you plan on using dragons heavily in your game, and don’t mind adjusting or, in high level scenarios, entirely remaking stat blocks, Draconomicon: Chromatic Dragons is certainly worth a look. 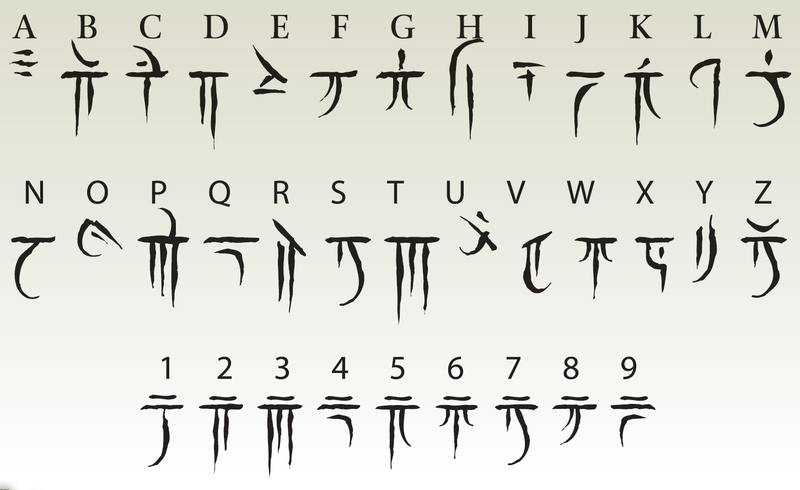 Draconic, or Auld High Wyrm, is used in spellcasting by wizards…but the actual runes are the Tengwar, from Tolkien’s Elves. It just adds more style to the spellbooks and scrolls!